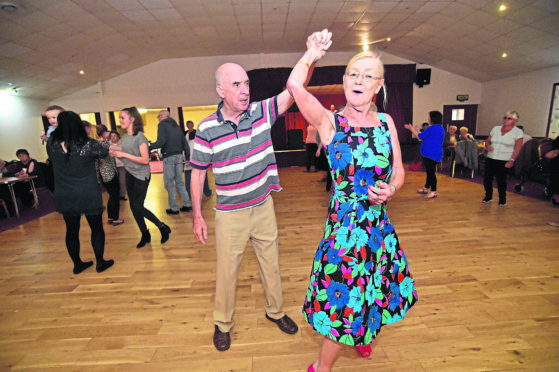 A north-east town held its first-ever dementia and disability friendly disco yesterday. Around 170 people went along to Boogie at the Bar at Fraserburgh Leisure Centre. The event is aimed at giving people with dementia, their carers and others with additional support needs somewhere to go during the day. It was launched at the Foundry Bar in Aberdeen by Anne and Bill Duncan last year, and regular events are now held in Peterhead, Elgin and Alford. Classic hits by Elvis Presley and Bill Haley and His Comets were played and lunch was provided at yesterday’s dance in Fraserburgh. She said: “This is amazing for the first one and it just shows there is a need for it. “It is for anybody who wants to have a dance and socialise. “It helps gets people active as they can just have a dance and we even have people dancing in their wheelchairs. Boogie in the Bar in Fraserburgh has received the backing from a number of local and national organisations. The Rotary Club of Fraserburgh, Aberdeenshire Voluntary Action, Fraserburgh Vintage Car Rally, Gray and Adams, Aberdeenshire Health and Social Care Partnership and Alzheimer Scotland all support the project. Ritchie Duthie, the general manager of Fraserburgh Leisure Centre, is predicting that similar events will pop up in other towns across the north-east. He said: “We have already spoken about doing an anniversary event in the large concert hall at the centre. “By this time next year there could be Boogie events in Banff and Macduff. The next Boogie in the Bar event is being held at Fraserburgh Leisure Centre on Wednesday, August 8 at 1.30pm. For more information call 07876 391525.